By: Otto S. Shill, III, Attorney, Jennings, Strouss & Salmon, P.L.C. The Arizona Supreme Court has unanimously upheld Arizona Proposition 206, which, effective January 1, 2017, increased Arizona’s minimum wage to $10.00, and requires employers to provide paid sick leave to employees beginning July 1, 2017. The statute, known as the Fair Wages and Healthy Families Act, is the result of a 2016 voter proposition. It has been highly contested by numerous business organizations; however, with this decision, employers must take immediate steps to ensure that they (i) are compliant with the minimum wage requirement already in effect, and (ii) prepare for the policy and recordkeeping changes that will be required for the addition of paid sick leave benefits beginning July 1. While legislative efforts may be forthcoming to make changes to this law, permissible changes are limited because it was passed by voter initiative. So, a higher minimum wage, as well as paid sick leave for all Arizona employees, is now a reality that employers must acknowledge. 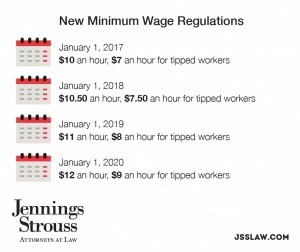 The labor and employment team at Jennings, Strouss & Salmon is available to help evaluate your current plans and assist with the creation and implementation of new or revised policies to ensure your business is compliant. Employers have many options for hiring labor and employment legal representation; however, unlike Jennings, Strouss & Salmon, few encompass the reputation, history, experience, and full-service functionality under one roof. Minimum wage and overtime issues under the Fair Labor Standards Act create unique challenges for employers. We offer creative solutions and swift litigation support. From internal compliance audits to Department of Labor investigations, we guide clients through the maze of regulations to ensure they comply with the ever changing laws, and defend clients facing wage and hour litigation in both individual and collective claims. Our labor and employment attorneys are also experienced at handling the wide-range of employment issues that challenge businesses, big and small. They regularly assist clients in hearings before numerous administrative agencies, such as the EEOC, OSHA, NLRB, OFCCP, U.S. Department of Labor, Arizona Civil Rights Division, and the Arizona Department of Economic Security. In addition, our labor and employment attorneys are skilled litigators, defending clients in all types of lawsuits brought before state and federal courts (both trial and appellate). They also assist our clients in resolving disputes through negotiation, mediation, arbitration, early neutral case assessment and other alternative dispute resolution techniques.